A beautiful smile can be argued as the real window to the soul. The eyes have held that title, but a dazzling and toothy grin can be a force to be reckoned with. Without the confidence and self-esteem that comes along with a gorgeous smile one may fall into a dark world where their smile is not shared, which can make a difference on so many aspects of life. Smiling impacts ours and others lives in such an incredible way, so those who are less-than confident with their pearly whites (or lack thereof) understand the burden missing teeth can have on their life. Humans have been creating false teeth for centuries. As long as we’ve wandered the planet there has been a need to replace missing teeth as a way of filling a confidence void. There is archeological evidence that dentures were around long before the year 1500 B.C. By threading gold wire through human teeth the Egyptians produced a set of functioning false teeth that (for the most part) functioned as real teeth. This mysterious country has been known for producing the oldest pair of dentures. A set of wooden teeth were produced that were traced back to the Ganjyoji Temple in Kii Province. Surprisingly these dentures had almost the same shape as modern dentures. Japanese culture used these wooden-false teeth until the late 19th century. Ciao Bella… is much easier said with a nice set of teeth. Animal teeth were often used in Italy as a proper tooth replacement. Using wire, animal teeth were bound to human teeth to act as a replacement. Even though they fell apart quite easily, they were simple to repair and replace. Rock or bones of any sort were a hot commodity in the “denture” world of the early civilization of the Mayans. Archaeologist have said that the ancient Mayans experimented with tooth replacement around 600 A.D. They placed seashell fragments and chips of bone in empty cavities where teeth use to be. There is evidence that these methods actually worked well because these materials fused permanently with the jawbone. Land of the free, home of the perfectly straight and pearly white teeth. The first dentures in America went to President George Washington, but they are falsely believed to be made of wood. His denture were actually made from hippopotamus ivory, horse, and donkey Washington suffered from poor dental health and hand numerous procedures done to construct functional and natural looking teeth, so that he could smile with pride as the President of the United States. In 1952 a renowned orthopedic surgeon, Per-Ingvar Branemark, discovered that he could not remove a very small titanium cylinder that he inserted into a rabbit’s leg because it had fused to the bone. This propelled dental implants into the world of dentistry. Fusing to the jawbone allowed the implant to be stronger and more permanent, but also kept the structure of the jawbone intact. This brings us to today’s technology when it comes to dentures and dental implants. History has given us a great platform to start from and we have come a long way from the gold-wired replacements. Today people have the option of choosing from traditional dentures (which are far and beyond the olden days of wooden teeth) and permanent dental implants. 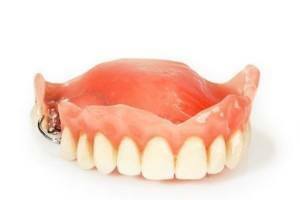 Dentures are a common option of false teeth that are secured with adhesive. Although they are a completely natural looking way to replace missing teeth they also have their setbacks. Dentures can slip out of place while talking or eating, which can be an embarrassing side effect. Dental Implants are the most popular choice for replacing missing teeth. They are permanent, easy to clean, and look just like natural teeth. A titanium screw is placed into the jawbone, which fuses to the bone, then after adequate healing time, a crown is permanently attached. This is a great choice for one missing tooth or for full reconstruction. Because they fuse to the bone they also keep the jaw from receding causing facial collapse. Whether you are suffering from one missing tooth or many, our office will go over your options and make sure you get what is right for you. You will be smiling with a full set of new and beautiful teeth in no time.